Meet some of our teachers! Olena was born and raised in Odessa, Ukraine. She began her piano studies at the age of three. She attended the Odessa Special Music Boarding School and received a Bachelor Diploma and a specialist Diploma in Music Teaching and Piano Concert Performance. She has won many piano competitions including the First Prize in the Piano Competition “Blue Bird” in Simferopol, Ukraine ; the Third Prize in the International Competition in memory of Sergei Prokofiev; the Special Diploma in the International Piano Competition in the name of Emil Gilles; and the Special Prize in the International Piano Competition in the name of Vladimir Krainov. Find out more or choose a class with Olena here! 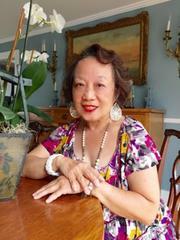 Li-Ly Chang, is a pianist, composer, teacher, and chamber musician. She has received many grants and awards including MD State Arts Council, Jordan Kitts Music Teacher’s Enrichment grant, MD State Music Teachers Association and Montgomery County Music Teachers Association grants. Her performances include the Dame Myra Hess Series, Carnegie Hall, Kennedy Center, Roosevelt Hall, Shriver Hall, Strathmore Center, Savannah on Stage Festival, Levine School, and New England Conservatory. Her piano teachers include Sacha Gorodnitzki, Leon Fleisher, Sequeira Costa, Fernando Laires, Walter Hautzig, Jack Winerock and Ming Tcherepnin. Her composition teachers are Joe Nelson, John Pozdro and Henry Mitchell. She has been invited to perform and teach at International School in Shanghai in 2017. She was a music panelist for the Maryland State Arts Council and is the Director of the International Young Artist Piano Competition, Washington DC. She is a faculty member at Montgomery College in Rockville, MD. Núria was born in Barcelona, Spain and began learning music theory and piano at a young age. She studied both at the Conservatori Municipal Superior de Musica de Barcelona for ten years. She also studied piano in Germany with Stanislav Rosenberg for an additional four years. Since moving to the United States she has continued her classical piano studies with renowned Russian pianist Nikita Fitenko. Núria competed in her first Washington International Piano Artists Competition in 2017, and looks forward to competing again in 2019. Olena has performed extensively throughout the Ukraine including performances with the Odessa Philharmonic Orchestra. 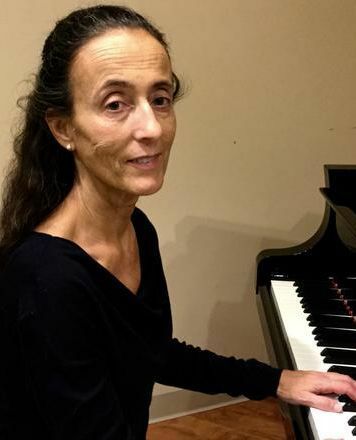 A hardworking mother of two, Nuria has been playing the piano for over four decades. She taught beginner and intermediate piano to children and adults for over 5 years before joining the Jordan Kitt’s team in 2019. Based on her students’ interests, she teaches classical, contemporary and modern styles of music. Find out more about our private and group lessons for either adults or kids here! Posted on January 19, 2019 January 19, 2019 Author PJ OttenritterCategories Company News, Education, Music & Technology, Music Education, Music, Health & the BrainLeave a comment on Meet some of our teachers! Nothing says it’s nearly Christmas quite like a 3D-printed robot hand busting out a festive classic on the piano. Fortunately, this year the tradition continues (or, let’s be honest, starts) courtesy of researchers from the U.K.’s University of Cambridge. Using a 3D printer, they have created a soft robot hand — attached to a robot arm — that’s able to play the piano in a variety of styles, including clipped “staccato” and smooth “legato” notes. And what better way to showcase it than with a rendition of Jingle Bells? While this isn’t the first piano-playing robot we’ve covered, what makes this robot neat is that it can achieve this fairly complex action despite being pretty limited in its movement. For instance, the hand is unable to move its fingers independently. That’s in stark contrast to the real human hand, which is capable of incredibly fine-grained motions thanks to its various points of articulation. The fact that it is therefore able to carry out actions as complicated as playing musical phrases on the piano is a testament to what can be achieved through some enterprising design. When it comes to this robot hand and its attached robot arm, the movement really is all in the wrist. If you’re going to enjoy a lifelong hobby, you can’t beat the benefits of playing a musical instrument. In addition to bringing joy to yourself and any listeners you might have, you’re doing great things for your brain. 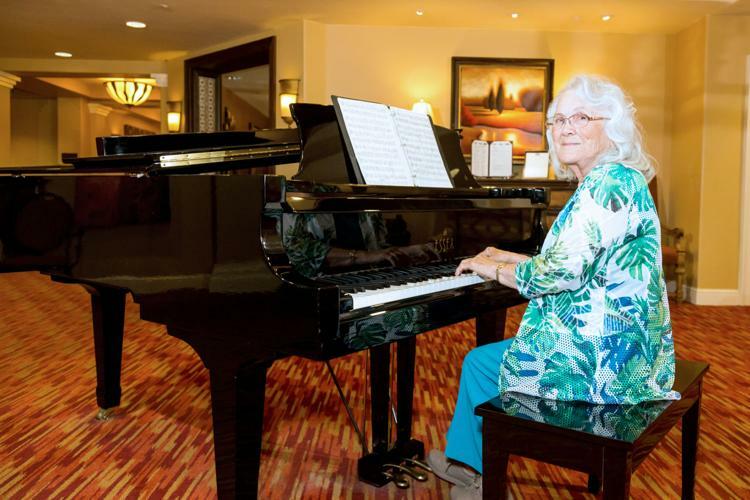 Marie lives at Splendido, an all-inclusive community in Tucson for those 55 and better. She and her husband Joe moved there in 2012, and they had an interior wall in their new apartment home removed and another one moved to accommodate her 7-foot grand piano. Marie plays popular music for residents at dinner time, using the piano situated in a hallway outside the restaurant entrances at Splendido. She is also the accompanist for the Splendido Singers, and shares piano-playing responsibility for Vespers in the community. Marie’s family moved around quite a bit during her childhood. “Everywhere I lived as a child, be it Nebraska, Wyoming, Oregon, or California, I found a piano teacher,” she says. “I always got to study with somebody.” As she grew older and more skilled, she started teaching piano herself—both private lessons and in a private school. “I’d use the money I earned for my own private lessons, every chance I got!” she says. Over the years, Marie has participated in master classes and had private lessons with Lili Kraus, Karl Ulrich Schnabel, Wilhelm Schwarzott, Peter Vincent Marlotti, and Rosina Lhévinne. Playing an instrument on a regular basis offers multiple benefits for your brain. That’s because it simultaneously works different sensory systems in the brain along with your motor skills. This coordination of efforts provides a workout for your brain—the kind of workout that strengthens connections within the brain and keeps you mentally sharp. In turn, this can improve your memory and cognition; one study showed that musicians perform better on cognitive tests than those who don’t play an instrument. Musical training has been proven to increase gray matter volume in specific brain regions and strengthen the connections between them. Other research has shown that such training can improve long-term memory, verbal memory, and spatial reasoning. And multiple studies have shown that playing music helps improve concentration—not just when playing, but in all areas of daily life. It should come as no surprise that playing music can reduce stress, but it can also lower blood pressure, decrease heart rate, and reduce anxiety and depression. While many people often consider music a universal language, a recent Massachusetts Institute of Technology (MIT) study done in Beijing shows that it may help with spoken language as well. Kindergarten students who took piano lessons showed increased capabilities to distinguish pitch and understand spoken words — and it showed up on their brain scans, according to the study’s findings. Researchers from the International Data Group (IDG)/McGovern Institute at Beijing Normal University wanted to compare the effects of music education on reading versus standard reading training. The reading training included an interactive reading experience, in which the teacher read words aloud from enlarged texts, and the students read along with the teacher. “If children who received music training did as well or better than children who received additional academic instruction, that could be a justification for why schools might want to continue to fund music,” Robert Desimone, Ph.D., senior author of the research article and director of MIT’s McGovern Institute for Brain Research, explained. A group of 74 Mandarin-speaking children, ages 4 to 5, were randomly assigned to three smaller groups. One group got piano training, the second group was trained in reading, and a third control group received no extra training at all. Piano training included 45-minute piano sessions three times a week. After six months of piano lessons, researchers found that the students were better at differentiating between spoken words and vowel sounds. The group with reading training had similar results. 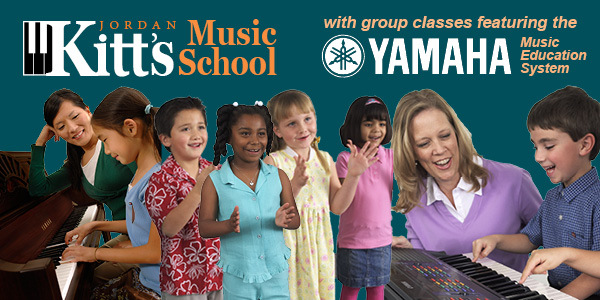 However, the difference between these two groups came in “consonant-based word discrimination.” The piano lessons group did better; this correlated to the group’s response to differences in musical pitch, which was observed immediately after the children heard a pair of notes in a sound-proof room and were then asked to differentiate between pitches. While the study involved a small sample size and the differences in performance between the piano lesson and reading groups weren’t found in all studied areas, the researchers say that the findings were still significant when looking at language study. 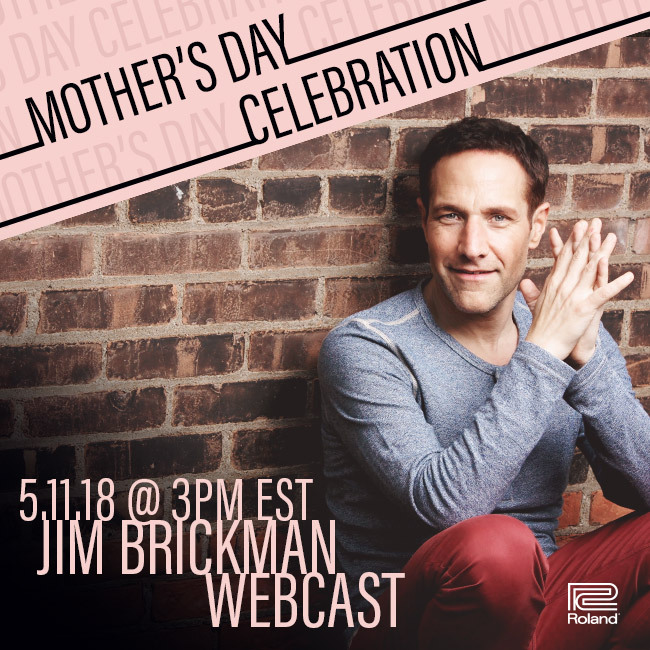 Live Mother’s Day Celebration Webcast with Jim Brickman! Make Mother’s Day extra special this year with a free, live concert from Jim Brickman. Invite all the moms in your life and join us online for this free webcast featuring songs, stories, giveaways, and video dedications. When you RSVP, you’ll be entered to win a brand-new Roland RP102 Digital Piano! Plus, you’ll receive a link where you can share a personal video message to your mom which may be selected to air during the webcast. Click the button below to register, send your video, and let Jim make this a Mother’s Day to remember. Posted on April 20, 2018 Author PJ OttenritterCategories Area Concerts, Music & Technology, RolandLeave a comment on Live Mother’s Day Celebration Webcast with Jim Brickman! On Monday, March 12th the Piano Technician’s Guild held their annual meeting at the Jordan Kitt’s Music Showroom and Music Education Center in Rockville, Maryland. Ace Ugai and action removed from a Yamaha CFX concert grand piano. In his words, a master of the craft must include consideration of the room acoustics ,tuning and action regulation specifically tailored for those conditions. The class identified the sounds and effects to look for, and demonstrated how to listen, evaluate and manipulate all of those facets. The Piano Technicians Guild, Inc. is the largest non-profit organization serving piano tuners, technicians, and craftsmen throughout the world. Formed in 1957 by the merger of the American Society of Piano Technicians and the National Association of Piano Tuners, the Guild was organized to promote the highest possible service and technical standards among piano tuners and technicians. The Washington DC Chapter was the first chapter in the Piano Technicians Guild (PTG). We have approximately 70 members in our chapter and over half of our members are Registered Piano Technicians. A Registered Piano Technician (RPT) is a piano technician who has passed a series of rigorous tests given by the PTG. Watch out Chopin: a Polish university student has programmed a robot to play the piano. 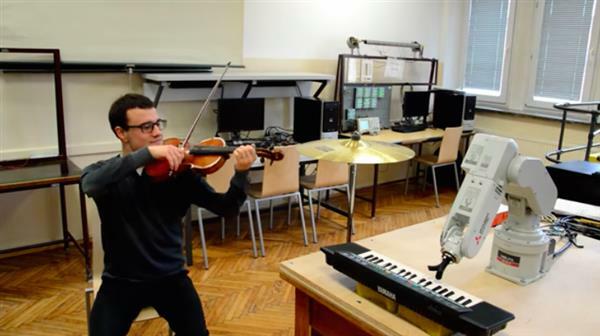 The musical robot, which pushes piano keys using pronged 3D printed fingers, was developed specifically to accompany its creator while he plays the violin. The student behind the project, Wojciech Świtała, was inspired to program the 3D printed robot as part of his master’s thesis project at the AGH University of Science and Technology in Krakow. Through the project, Świtała found a creative (not to mention, entertaining) way of combining his studies in the faculty of electrical engineering, automatics, computer science and biomedical engineering with his passion for playing music. While the piano-playing robot admittedly does not have the musical chops of a human pianist (or perhaps even a relative novice), the robot is capable of carrying a tune and provides a nice, simple piano accompaniment. The robot itself is based on one of Mitsubishi’s robotic arms, which Świtała equipped with a 3D printed hand (more of a prong) and programmed to play certain melodies on the piano. That’s right, the robot doesn’t just play one series of keys, as it can actually be “taught” different sequences. Świtała explains that users simply have to click virtual piano keys in a computer program and the sequence will be saved and sent to the 3D printed robot, which will then “learn” the melody and can play it back when placed in front of a keyboard. Of course, because the robot isn’t equipped with a set of ten fingers—like most pianists are—it is quite limited in terms of its musical capabilities. What the two-pronged robotic arm can do is play two keys at once, and press them in good time. In the video demonstration, you can even see the 3D printed bot hit a cymbal! Świtała admits that the robot is in its early stages and that there are still some significant kinks to work out in its operation. For one, the sound of the robot’s motor is not ideal for producing music (unless you’re specifically looking for a technological buzzing), and the robotic arm is still quite slow.